The Wasteland is part of the Ostriches (an-na’a’im) celestial complex, which includes the Drinking Ostriches (an-na’am al-warid), the Returning Ostriches (an-na’am as-sadir) and the Ostrich Nest (al-udhi). The Wasteland is a region of sky that has no bright stars, located next to the Ostrich Nest, between the Ostriches and the Auspice of the Slaughterer (sa’d adh-dhabih). 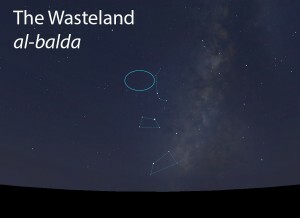 The Wasteland (al-balda) as it appears in the west about 45 minutes before sunrise in late June. Sky simulations made with Stellarium. A region of sky devoid of bright stars, located between the Ostriches and the the Auspice of the Slaughterer. An empty region of sky located near the stars of the Ostrich Nest (ξ, ο, π, 43, ρ, υ SGR). The Wasteland does not figure in the calendar of the rains stars. 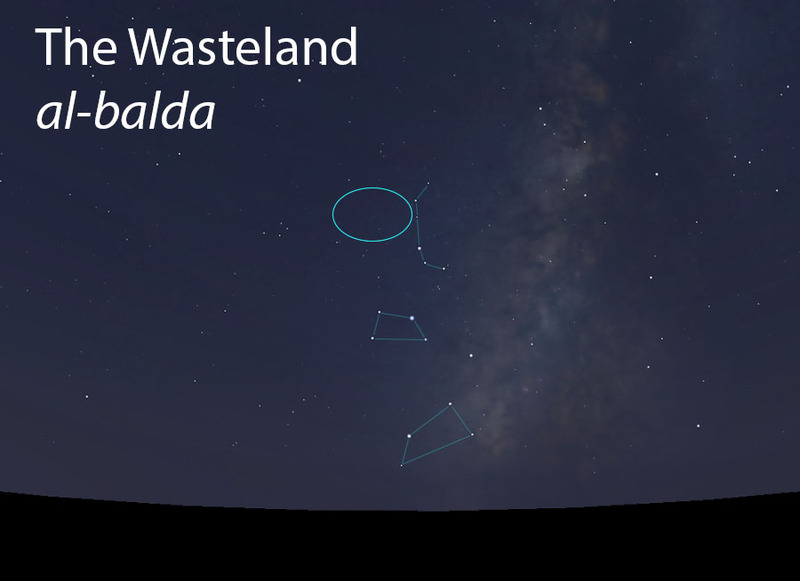 In early listings of the lunar stations, the Wasteland is the 23rd station of the year. This was later changed to the 21st lunar station after the stations were adjusted to begin with the vernal equinox. The Wasteland is part of the Ostriches (an-na’a’im, النعائم) folkloric celestial complex.